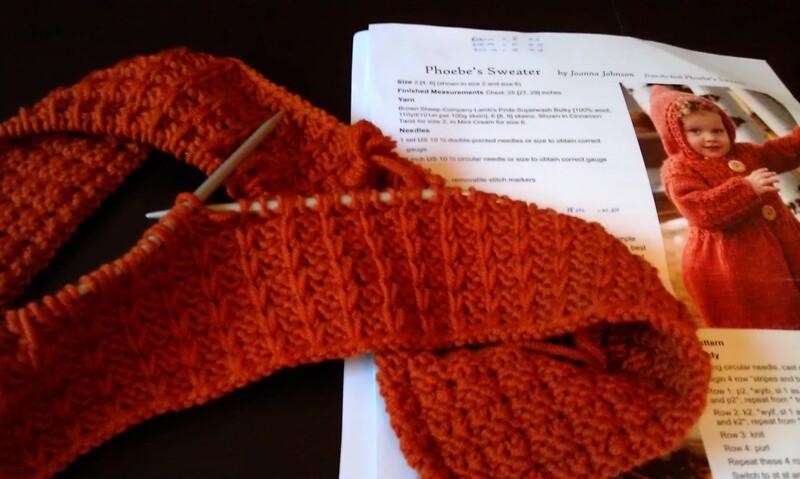 Last week I saw on Ginny’s post that she was knitting a Phoebe Sweater, an item that I had laid my eyes on for some time now. So I showed the ravelry page to my boyfriend and he was instantly convinced when I told him that those coats would make perfect christmas presents for his nieces (if he paid for the wool). And after testing for gauge with two different yarns, I decided for the Drops Big Merino that was in my testing order. It means I have to do a little bit more stitches (about 1.29 times more, I have calculated) but they have great colours and the yarn is on sale at the moment here. So what did I do? I ordered kilos of yarn and I started knitting with the one skein I already had. It knits up really fast. I have finished the Ode to Veera and it looks pretty amazing now it is blocked and all the ends (oh, there were so many..). I am very happy it turned out so nice because this means it is going to be a Christmas present. One down on the list. After I had finished the Ode to Veera I moved on to my toddler sweater. I knitted the whole back part up to the raglan sleeves only to then compare front and back for the first time… I thought with a yarn variegating in so many colours working with a different dye lot would make a difference but it does. And how it does. I was totally frustrated. I frogged it and I will start new with different yarn that will come together with the Big Merino. So what to do on the weekend? 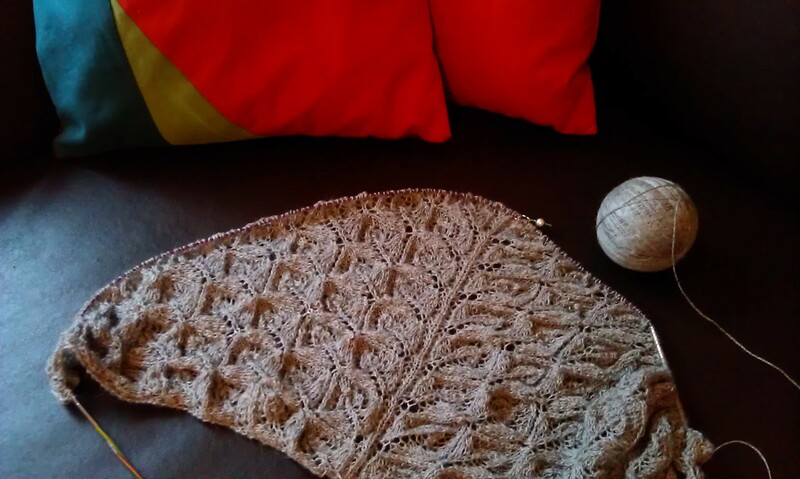 I worked a few rows on my Tree of Light but this lace knitting is really exhausting and by now the rows seem to take forever even though the shawl is still small. 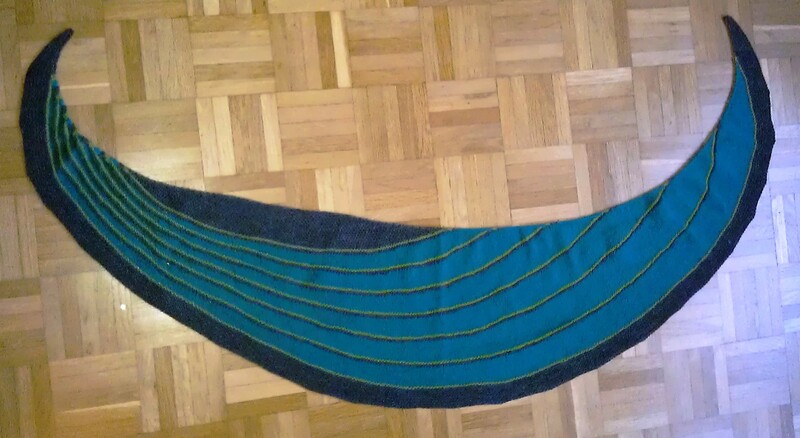 So I did my work for September on my brother’s Christmas Sweater: working a few rows of the colourwork (look you can already see what it is!) and I knit the sleeve. And because I have nothing else to do, I started knitting the second sleeve too. I will have quite a bit to work on with the Phoebe sweaters so it is probably a good idea to get done what could be done at the moment even though it it isn’t thrilling me much at the moment. All this means I’m now in book 4 of the Queen Betsy audiobook series I started last week. And I finished Jo Nesbo’s second book. And with that as usual I join Ginny’s Yarn Along and ask you: what about you? This entry was posted in Knitting & Crocheting and tagged Cardigan, Knitting, shawl, Sweater, Yarn Along by kathatravelling. Bookmark the permalink. 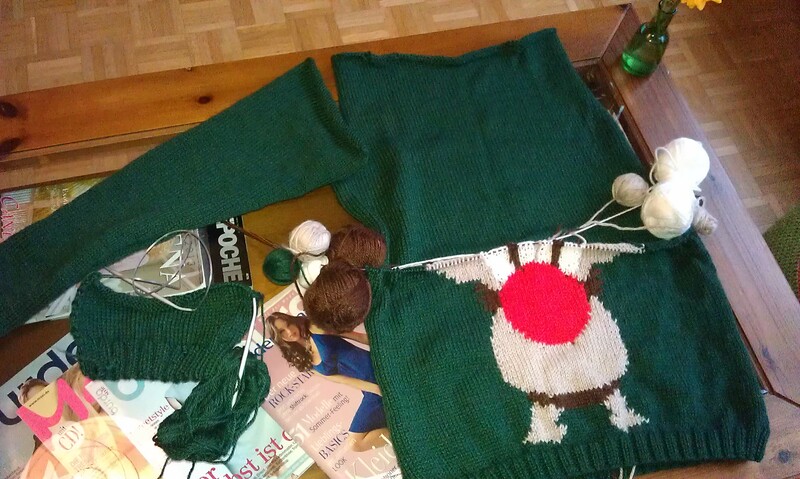 you are well on your way to holiday knitting….and i’ve just barely started!!! eeek! should I be panicking yet?